Inground swimming pool liners come in a wide variety of patterns. Some of the things to consider are the thickness of the liner, your color choice, the length of the warranty and the quality of the vinyl. 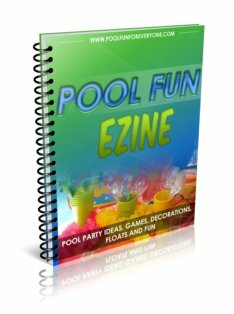 The most popular inground swimming pool liners are vinyl liners. 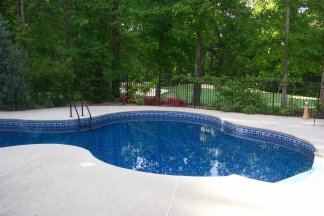 Inground pool liners can be made of vinyl or gunite. A gunite pool is permanent and is made with concrete and plaster and is usually more expensive to build. We chose to go with vinyl for lots of reasons and after 15 years of pool ownership we are happy we did. Vinyl swimming pool liners are the number one choice of inground swimming pool liners. A vinyl pool has reinforced walls and a vinyl liner. It locks the top edge, called a bead, into a track located on the bottom of the coping. 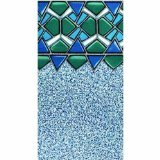 Viny pool liners come in different thicknesses, a variety of colors and patterns and with different warranties. The two most common are 20 mil and 27 mil. 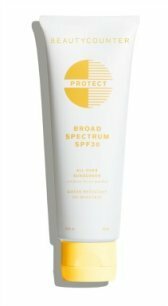 You can also purchase a blended thickness, meaning it is 27 mil along the top where the liner is most exposed to the hot sun and 20 mil along the bottom of the pool. Sometimes you will see gauge used instead of mil - they are different. Be sure you are comparing apples to apples. 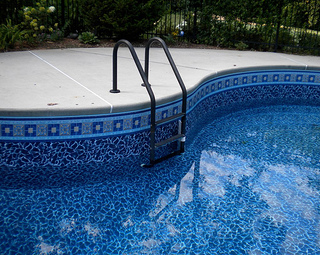 Vinyl swimming pool liner warranties can range from 10-25 years. There is a warranty that comes from the manufacturer that usually covers seams separating or if the print comes off. The first couple of years, the liner may be covered at 100% and then prorated after that. 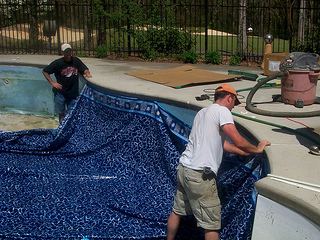 The coverage for labor will differ with each pool liner installer, so be sure to ask. Inground swimming pool liners come in a variety of colors and patterns. 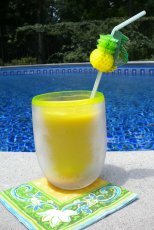 Our first inground pool liner was a light color. For different reasons we had some staining that showed on the liner. We often used a stain remover, which then caused the pattern to fade. After 10 years the light pattern was almost gone. This time we chose a darker pool liner and pattern. Everyone who comes to the pool says how much better it looks. We like it much better as well. The picture at the top of the page is our new pool liner. Be sure to select a inground swimming pool liner with a pattern - do not choose a solid color liner. Choosing pool liners can be fun and sometimes confusing. Making a selection from a small swatch of vinyl is not an easy way to make such a big decision. It really helps if you can go see someone's pool who has that same pool liner installed. Don't be afraid to ask your installer if they have installed the liner that you like at another pool. If so get permission to go look at it. When we first built our pool we did go with our pool builder to several other pools that he had put in. It gave us an idea of what shape we wanted and what color pool liner we liked. What should you know to help you in your selection? Read on to learn more. Replacing pool liners is one of the costs of owning your own pool. Normally, vinyl inground swimming pool liners need to be replaced every 7-9 years depending on the use of the pool, how well it is maintained and how much sun it is exposed to. Try to repair small leaks or holes in your liner with a swimming pool liner repair kit. We did this several times and we were able to extend the life of the liner by one more season. However, this year we got a 3 foot tear just about the water line. This is the spot where the liner gets the most sun. When it is time to replace your pool liner get at least 3-4 estimates. There has been quite a range in the prices - with a price difference of $1500 between the highest and the lowest estimate. In order to compare apples to apples you will need to find out what is included in the estimates. A liner that leaks is inevitable and goes along with pool ownership. Swimming pool liner repair is not that hard and for a while we were able to do this for all the small leaks and tears in our 9 year old vinyl liner. Try to repair small leaks or holes in your liner with a swimming pool liner repair kit. We did this several times and we were able to extend the life of the liner by one more season. Some repairs we were able to do ourselves and others we turned to the pool liner repair professional, Jason. He would come to our pool, put on his wet suit and tank, and scour the bottom and sides of the pool looking for leaks like Sherlock Holmes. Inevitably he would find them and repair them and save us from having to replace the liner for another year. If you find that the water level is going down quicker than it should, you can test it by putting a bucket of water out by the pool and mark the water line. Mark the water line on the pool. After a couple of days compare the marks to see if the loss of water in the pool is comparable to the water loss in the bucket. Also check to see if you only lose water when the pool is running. Often our water loss has been from leaky plumbing. Once we corrected the plumbing, our water loss stopped. A common place for a leak is around the stairs - so check there first. 2. Purchase a liner repair kit. Find a repair kit that also includes some vinyl. We were provided with extra vinyl when we had our vinyl swimming pool liner replaced. It is good to have some extra on hand to use if and when some leaks develop. We didn't have any extra vinyl from our first liner so we had to use a large piece of plain white vinyl which looked like a really big (ugly) bandaid. Inground swimming pool liners can be purchased on line and are available if you are interested in doing the installation. I checked into several on line companies and talked with some knowledgeable customer representatives who not very convincingly told me, "it is not that hard to do." You can often get the liner at the same whole sale price that's is given to a pool liner installer. Of course they all say that it can be done by the home owner, but we were hesitant to give it a try when it came time to replace ours. Our pool is a lagoon shape, and I know that my measurements would not be very accurate. Most installers will tell you that measuring, buying and installing your own liner is very tricky and that most buyers don't measure accurately. Also there is other equipment you need like a pump to empty your pool and a vacuum type machine that helps the liner to lie taught with no wrinkles. Well, we have a very large free form pool.For starters just measuring our pool accurately disqualified us from attempting this task. When I did give approximate estimates for the size of the pool, the prices I was given were very comparable to the quotes I got from our local pool companies. In our case, we are letting the experts install the liner. Your new pool liner will benefit from maintaining the optimal levels of pool chemicals. 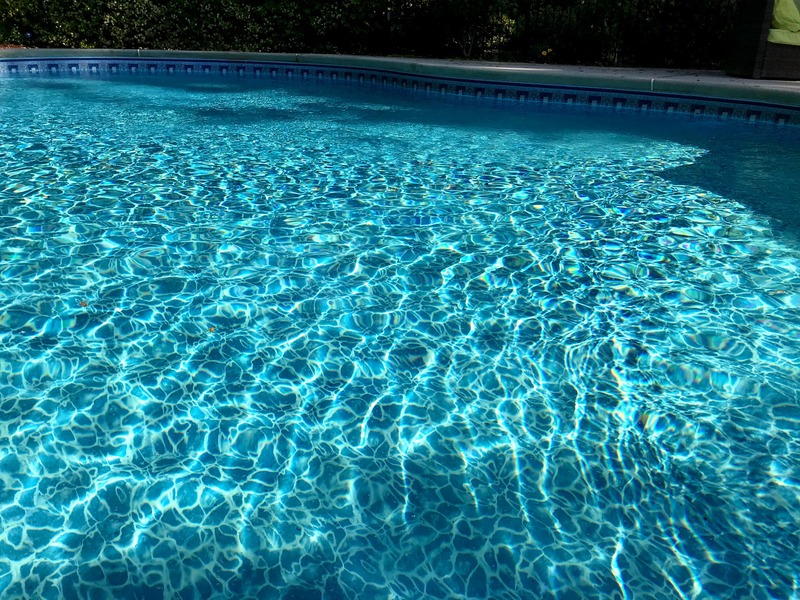 It is important that the chlorine levels are not too low or too high and that your pool water is in balance.